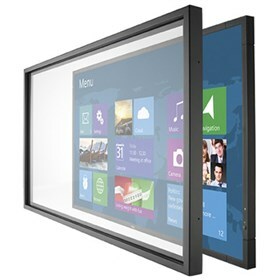 The NEC OL-V463 is an infrared multi-touch overlay accessory that transforms an existing V463 large-screen display into an interactive touch screen. It adds protective glass and multi-touch functionality to the already high-performance of the V463 commercial-grade display thus adding minimal depth. This overlay solution is HID compliant with a majority of operating systems so loading extra drivers is unnecessary. The OL-V463 features unique design that allows for swipe in and out functionality. Windows 8 makes this overlay solution future-proof with the newest compatibility for operating systems. The IR-touch overlay helps end-users to experience up to 10 simultaneous points of touch which is perfect but not limited to the educational, retail and corporate markets. The NEC OL-V463 has many exciting features for users of all types. You can extend the lifetime of your NEC OL-V463 with the purchase of a FactoryOutletStore Factory Protection Plan. See the NEC OL-V463 gallery images above for more product views. The NEC OL-V463 is sold as a Brand New Unopened Item.